Greeks are striking again. No surprise there. 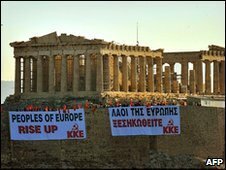 But, a cursory glance at the protests organized by "Greek civil servants" seems to reveal a few unifying symbol: hammers, sickles and lots of red flags. Maybe it's just a coincidence that events organized by European labor unions are always dominated by communists and Marxist propaganda. But I doubt it. Communists (and Leftists of all stripes) are like cockroaches -- you spray and spray, but they always come back. The reason is that human nature makes the politics of envy and resentment such a natural mobilizer. The only antidote for this is, of course, sound fiscal and monetary policies that promote stable growth (meaning also a smaller public sector), and education in the recent history of collectivism. Seems Europe and America have forgotten the totalitarian nightmares of the 20th Century.